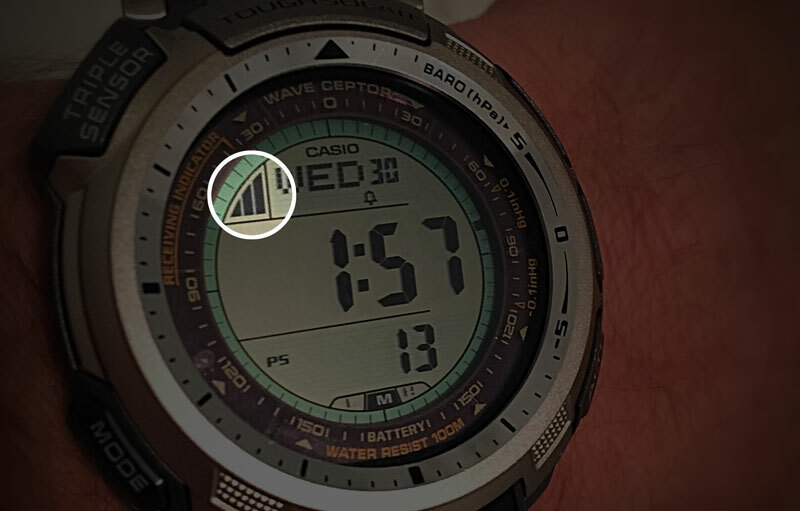 Living on the east coast of the United States (outside Boston), I had a slim hope that my Casio Protrek PAW1300T-7V would ever receive a signal from Colorado. A night went by when I placed the watch on a South West windowsill to no avail. I read many forum posts online which mentioned the difficulty in syncing from the East Coast. I checked the next day and saw that the atomic clock and my watch differed by less than 3 seconds. So I didn’t worry a lot about the sync. It was really close. Last night I went to bed, making sure Auto Sync was turned on. It was. I went to sleep, being on the North East side of the house, where our bed is located in the master bedroom. I figured whatever, it doesn’t matter. This morning I woke up and looked at the watch face – there were the three bars showing me a sync did indeed take place last night. I checked the R/C status and at 12:05 the sync happened. Wonderful! In the wrong corner of the house and wearing it (not facing a window)… and it worked. I think that the level of battery has a lot to do with a sync with the atomic clock. My high charge jumped back down to medium after I turned the backlight on a few times. That night I did not receive a sync. Last night I charged (via Coolfire LED) even though I was already at high (probably at the lower end of that). I received a sync at 5:04 AM – the last attempt I think (they start at 12:05 AM if you have automatic turned on). I should get another tonight pending any serious storm clouds.